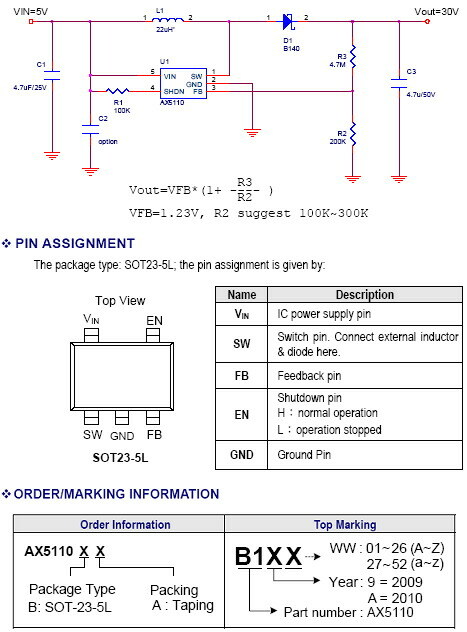 The AX5110 is a Pulse Frequency Modulation (PFM) DC/DC converter. It is Low quiescent current 30uA and shutdown current less 1uA. The AX5110 feature a wide input voltage. The operating voltage is ranged from 1.2V to 12V. It also feature low quiescent current, switching current limiting, low temperature coefficient. application to save space and lower cost. AX5110 is available in SOT23-5L package.